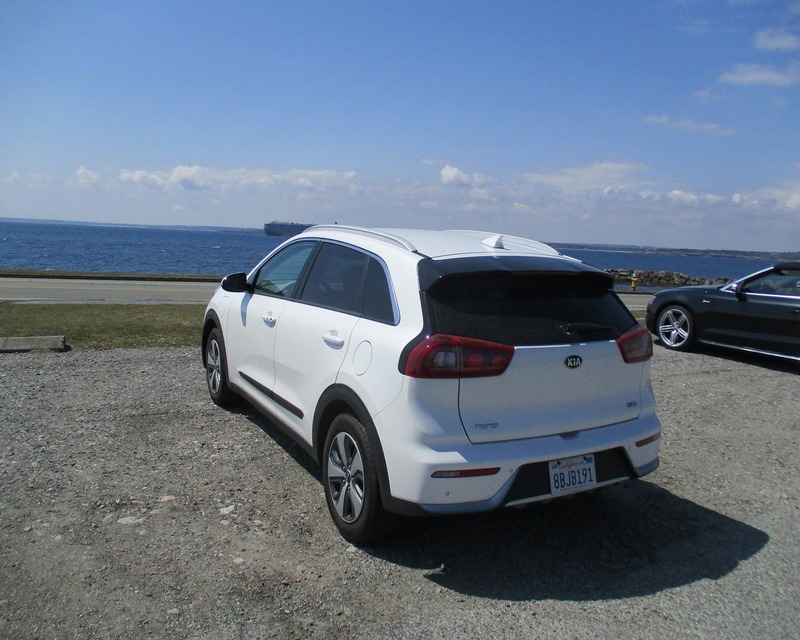 In November, 2016, Kia invited me to a ride and drive event for its new to North America Niro Hybrid in San Antonio. When I arrived at the hotel, it was dusk. Out front, bathed in the glow of several spotlights, was a white crossover SUV. My first impression was that the car was a new Mercedes model, but I was wrong. 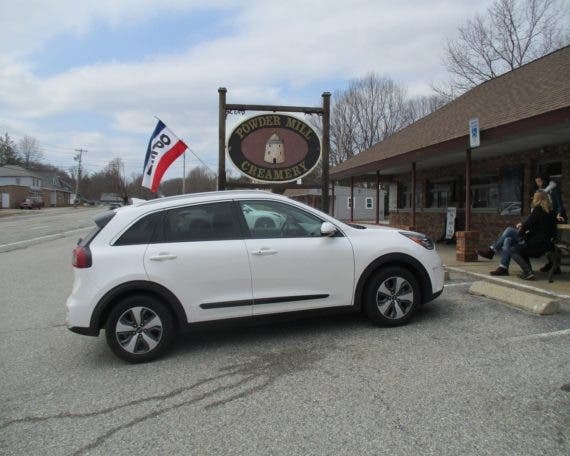 It was actually the Kia Niro I had come to see. 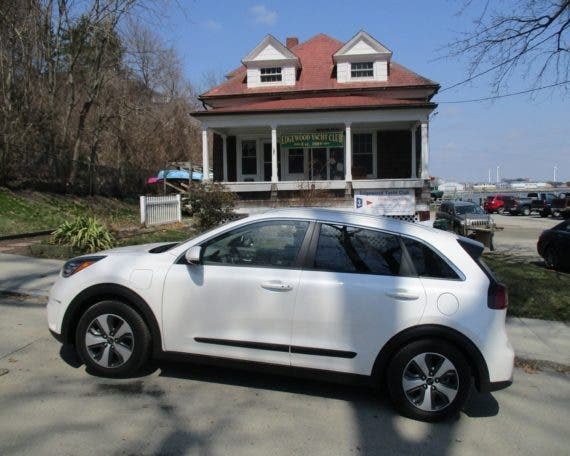 Last week, Kia delivered a loaner PHEV to my home in Rhode Island to use for a week. Here’s my take on the car after a week of pretend ownership. To say this car is appealing is an understatement. In an age where other cars feature sharp creases that meet at odd angles — the latest Toyota Prius being a prime example — the Niro is handsome, composed, poised, and thoroughly modern. Here at CleanTechnica, we tend to focus on specifications — kilowatt-hours, range, charging time — those sorts of things. But people don’t buy cars based on specs. They buy cars based on how they make them feel. 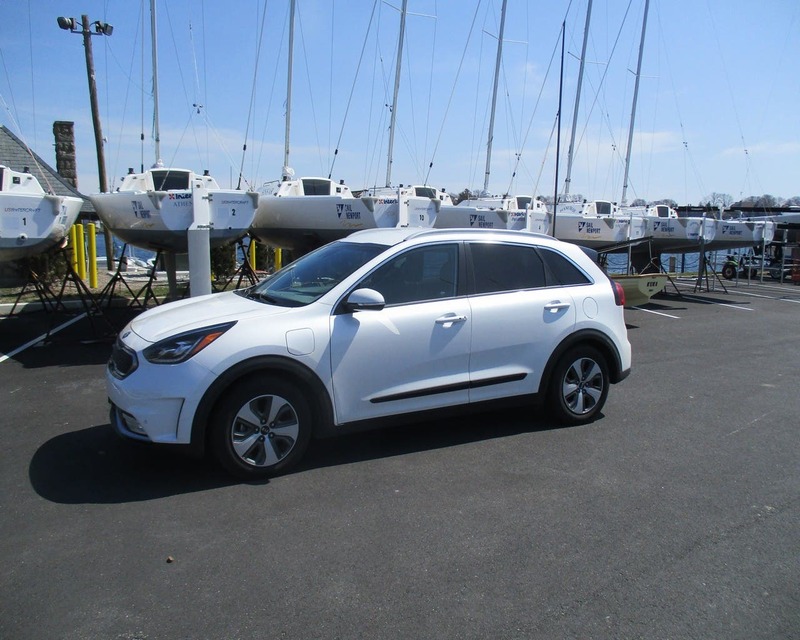 The Kia Niro excels at making the people inside feel good. OK. You want specs, so here we go. With an 8.9 kWh battery, the Niro PHEV has about 25 miles of electric-only range. For the average American on a typical day, that’s enough to get where you’re going and back without burning a drop of gasoline. It has a total of 139 horsepower available. The electric motor is rated at 60 hp. What sets the Niro PHEV apart from every other vehicle in its class is this — it has a 6 speed dual clutch transmission that operates in either normal or sport mode. Normal maximizes efficiency and fuel economy. Sport mode cranks up the fun-to-drive quotient and lets the driver select the desired gear. The transmission is ultra smooth in operation, shifting seamlessly up and down through the gears. All together, the impression one gets from the driver’s seat is that you are in a normal car. Forget about all the geewizardy under the hood. Get in and go. Sometimes the gasoline engine kicks in, sometimes it doesn’t. It doesn’t matter. The car glides along and is so quiet on the highway, the only sound inside that penetrates the passenger compartment comes from the tires. Charging the battery to 100% takes 2½ hours using a Level 2 charger or about 8 hours on normal household current. Regenerative braking is part of the PHEV package but is not adjustable by the driver. If the Kia people have missed anything in configuring the car, it is providing a regen paddle so the driver can take advantage of true one pedal driving. That’s a feature you didn’t know you wanted until you experience it for yourself. Then you don’t want to be without it. Performance is sprightly, if not in the “knock your socks off” category. The car accelerates faster than a traditional Civic, Corolla, Camry, or Accord. It is rated 105 MPGe by the EPA and gets 48 mpg on the highway, 44 in the city, and 46 combined once the available battery power is exhausted. According to the readout on the dashboard, I got a little better than 70 miles per gallon during the week I had the car. Total range with an 11.6 gallon tank is 580 miles. The onboard gasoline engine is called into service on cold mornings to help warm the interior without draining the battery. My loaner was the full zoot model with heated and cooled front seats, heated rear seats, and heated steering wheel. It had so many bells and whistles, the bells had their own whistles. The owner’s manual is smaller than an Oxford English Dictionary but only fractionally so. I confess I did not commit it all to memory and by the time my week was up, there were still many features of the car I had yet to discover. If there is something in the manual about regenerative braking, it is not listed in the index. I did turn off the lane departure warning system after the first few miles because it was beeping constantly. Some of that is due to poor lane markings on New England roads and part of that is because I still harbor a fantasy of being Jackie Stewart when I grow up and tend to follow the ideal racing line through turns. 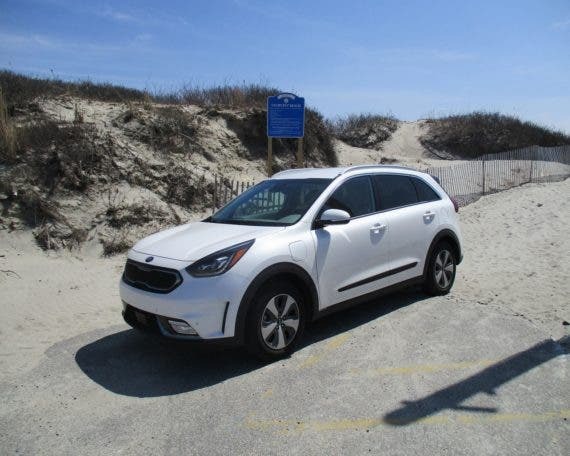 From a driving perspective, the Kia Niro PHEV has a well modulated ride that soaks up bumps and potholes with aplomb. It handles curves with authority and brakes with confidence. I did discover one of the dangers of driving a new car, though — it makes your daily driver feel like something from a Flintstone’s episode. My car had the optional feature that remembers seating and mirror settings for two drivers. I made the mistake of touching one of the buttons and immediately regretted it. As the power seat made its way toward the steering wheel, I felt like I was in the trash compactor scene from Star Wars. The passenger compartment of the Niro is a very pleasant place to be. The words I heard most frequently from people I took on test drives were “spacious” and “comfortable.” I was able to carry 4 people travelling from France with all their luggage with ease. My wife insisted the Niro was bigger than her Civic Si so we lined both cars up side by side in the driveway. She was shocked to find the Niro was more than a foot shorter than her car. The Kia Niro is a Goldilocks car — not too big, not too small, just right. It has enough range to be useful but a small enough battery to keep the sticker price of the top model well below $40,000. The base model starts at $28,840. A base Chevy Volt list for about $4,500 more. On the other hand, the Volt qualifies for the full federal tax credit while the Niro PHEV does not. I got to try the Chevy Volt two years ago and loved the car. It performs all the normal driving chores extremely well. It also has an all electric range twice as long as the Niro PHEV. So which would I choose if it was my money? Hmmmm, good question. Both are excellent cars. Personally, I would opt for the Kia only because it looks so stylish and has a lighter, airier interior and more useful carrying capacity. The higher SUV type seating appeals to me as well. The bottom line is, I could see myself driving a Kia Niro PHEV long enough to pay off a car loan and enjoying every mile. Different people have different needs and expectations. The good news is that those of us who want to drive an electric or electrified car have more choices than ever, with more coming along every day. The folks at Kia have made their best guess as to what size vehicle people want today, how much they are willing to pay for a new car, and what features they require. The Niro PHEV is perfectly proportioned, provisioned, and priced to hit the sweet spot of the North American market.